Needlepoint is one of many types of counted thread embroidery. Needlepoint can be carried out using a variety of stitched, but the most common method is to use tent stitch only and rely on colour changes (rather than texture) to produce the image. In needlepoint, a yarn is stitched through a specialized stiff canvas where there are openings at regular intervals. 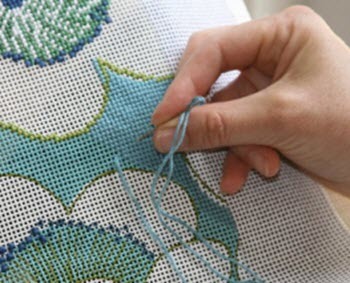 How detailed you can make your needlepoint embroidery will depend on the thread count of the canvas. The use of a stiff canvas is a main difference between needlepoint and most other types of embroidery, since non-needlepoint embroidery is more commonly made on soft cloth that needs to be kept stretch out with en embroidery hoop during the work process. 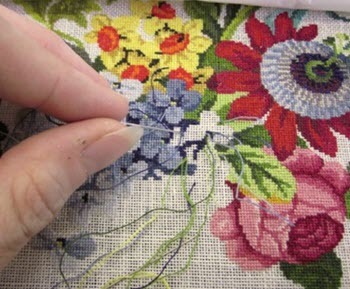 If a needlepoint canvas needs to be kept taut during stitching, the typical tool used would be a scroll frame, although some types of petit point work is actually made using a small embroidery hoop. Since needlepoint is typically stitched on an open-grid canvas, it can in a way be seen as making a new fabric rather than just embellishing an existing one. This is one of the reasons why needlepoint stitches tend to be sturdier than other embroidery stitches. Traditionally, needlepoint designs typically covered the entire canvas, but today alternative designs have emerged among the contemporary needlepointers. Many different stitch variants can be and are used for needlepoint, although some – such as tent stitches, random long stitch and Victorian cross stitch – are more common than others. One book that has really helped popularize a wide range of stitches for needlepoint embroidery during the second-half of the 20th century is “The Needlepoint Book” by Jo Ippolito Christensen. This book, which was first published in 1976, contains 436 different stitches for needlepoint. Needlepoint is also carried out using fibres such as metallic braid, metallic cord and raffia. Metallic fibres are especially popular for adding a bit of shimmer on a needlepoint work consisting chiefly of non-metallic elements. e.g. for making Christmas or Yule themed images look a bit extra festive and sparkly. The open even-weave mesh canvases used for needlepoint are usually single thread or double tread. In stores, canvas types are typically arranged by mesh size or thread count per inch. In a well-assorted embroidery shop, you can expect to find anything from 5 threads per inch to 24 threads per inch, although most embroiderers prefer canvas with at least 10 threads per inch. This is a plain woven canvas with one weft thread going over and under one warp thread. It is a very popular choice for needlepoint and gives a lot of freedom when it comes to manipulation and using open canvas. In a standard embroidery shop, you can expect to find mono canvas of various colours, especially if you want to buy the very popular 18 mesh variant. This is a very stable version of mono canvas, since it is made by twisting two thin threads around each other for the lengthwise tread and “locking” them into a single crosswise thread. Silk gauze interlock mono canvas is a popular choice for petit point work. The most common counts are 32, 40 and 48 count. If you need 64 or even 128 count for super miniature work, you might need to visit one of the larger embroidery shops or order online. The type of canvas referred to as rug is made from strong cotton threads. Two threads are twisted around each other lengthwise to form the mesh, and then locked around a crosswise thread made the same way. Commonly available gauges are 3.3 mesh and 5 mesh. This stiff canvas is a popular choice for children and novice needlepointers. It is easy to work with, suitable for trying out a wide range of stitches, and can usually be purchased cheaply in the form of small pre-cut pieces. Penelope canvas has two threads that are closely grouped together in both warp and weft. They can fairly easily be split apart. The configuration is commonly expressed using two numbers, e.g. 10/20. The first recorded use of the term needlepoint in the English language is from 1869, when it was utilized as synonym for point-lace. The history of what we today know as needlepoint does however go back much longer than this, just with other terms being used for this style of embroidery. Surviving items from Egyptian graves show that needlepoint embroidery existed in ancient Egypt. The famous archaeologist Howard Carter did for find needlepoint in the cave of a Pharaoh who had lived around 1500 BC. In parts of16th century Europe, canvas work in tent stitch, carried out on an evenly woven open ground fabric, was a widespread domestic craft. The version of needlepoint known as Bargello has been practised since at least the 17th century. In the 19th century, one of the trendiest types of needlepoint in Europe was shaded Berlin wool work using brightly coloured wool yarn. 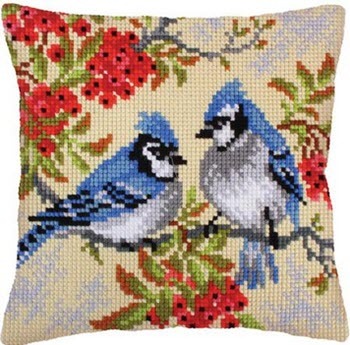 In more recent times, celebrities such as actresses Mary Martin, Loretta Swit and Sylvia Sidney, American football player Roosevelt “Rosey” Grier, and singer-songwriter Taylor Swift have all professed a passion for doing needlepoint work.